Nothing like a warm, sunny weekend to get me out for a nice leisurely bike ride through the neighborhood. My destination: 19 Paul BBQ in Morgan Park. So really, in addition to being an opportunity to take in the neighborhood’s energy, my bike ride doubled as exercise to compensate for the glorious display of gluttony in which I had just partaken. Along the way, I had the opportunity to further ponder Morgan Park’s existing beauty and potential as a more productive, pedestrian-friendly mixed-use neighborhood. In my eyes, the key is to focus on establishing the 111th Street Metra Station as an anchor in the community, much like we need to do in Beverly along 95th Street. Let me offer you a picture of Morgan Park’s two most visible destinations. In the center of the community, we have possibly the most glorious public space in the greater Beverly Area that isn’t to live up to its potential: Bohn Park, a classic “village green” surrounded by residences, storefronts and churches. 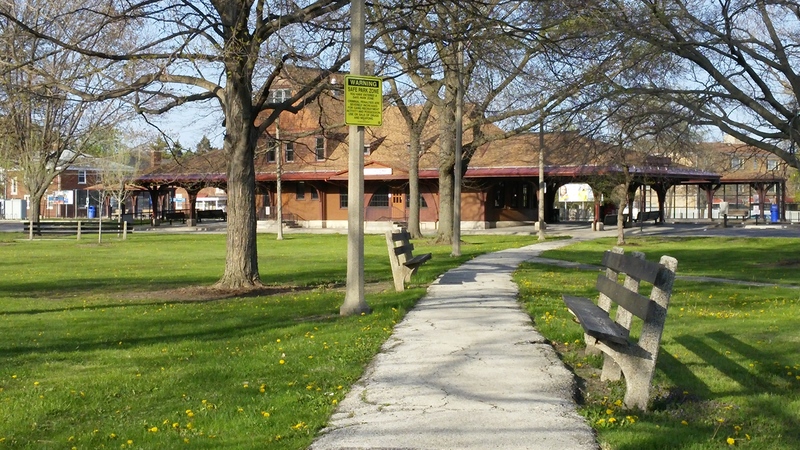 Bohn Park and the 111th Street Metra station in Morgan Park. Mixed-use buildings across from the park. 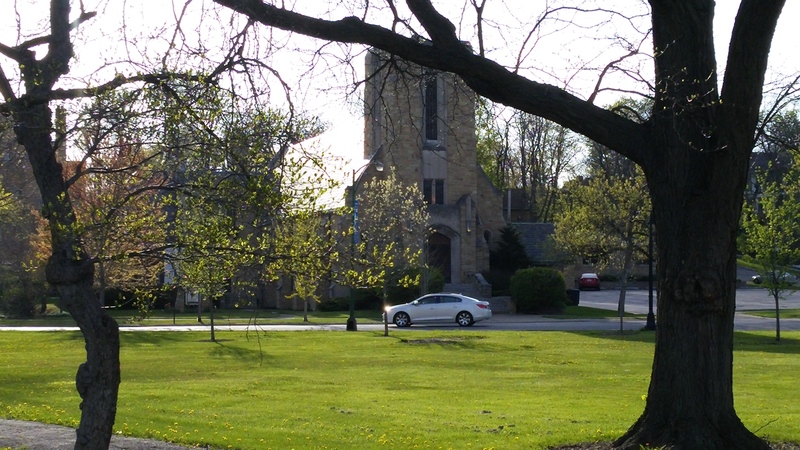 Morgan Park Presbyterian Church across from the park. It’s the type of space that, in a perfect world, would be bustling around the clock. In their wisdom, the community’s planners connected this central park with two other nearby public spaces: Prospect Gardens Park to the northeast and the neighborhood’s namesake, Morgan Park, to the southwest. These three parks, linked together, offer a miniature, localized version of our city’s grand boulevard system. Across from Bohn Park is a row of modest two story buildings with commercial storefronts on the ground floors and space for residences above. As I’ve written before, this was the standard way of developing properties, particularly those in close proximity to train stations, long before Americans abandoned traditional development patters in favor of auto-dependent sprawl. These types of properties were often developed by the railroad companies, aware that the land around their stations held the most value. Today, that land continues to be extraordinarily valuable. The 111th Street buildings sit on small lots and carry assessed values of $11.40 per square foot to $23.46 per square foot. Let’s compare that to Marshfield Plaza, a newer development that brought big-box retailers like Marshall’s and Target to the neighborhood and was built in what has become the standard suburban fashion: Sprawling, single-story buildings with plenty of parking (and then some). Oh, and this development is LEED Silver certified by the U.S. Green Building Council — never mind that the primary way to access the shopping center is by car, our country’s second-leading cause of greenhouse gas emissions after electricity. This development, at nearly 1.7 million square feet, including parking lots, carries a value of just $5.53 per square foot. That’s less than half the per-square foot value of the least expensive mixed-use building near the Metra station and less than a quarter as much as the most valuable. In other words, an acre of development that looked like the most valuable building near the Metra station would be assessed at $985,300, while an acre of Marshfield Plaza has a value of just $241,024. Given that property taxes play an even more significant role than sales taxes in the budgets of our city, school district, etc., which type of development would you want to pursue, especially knowing Chicago’s financial problems? 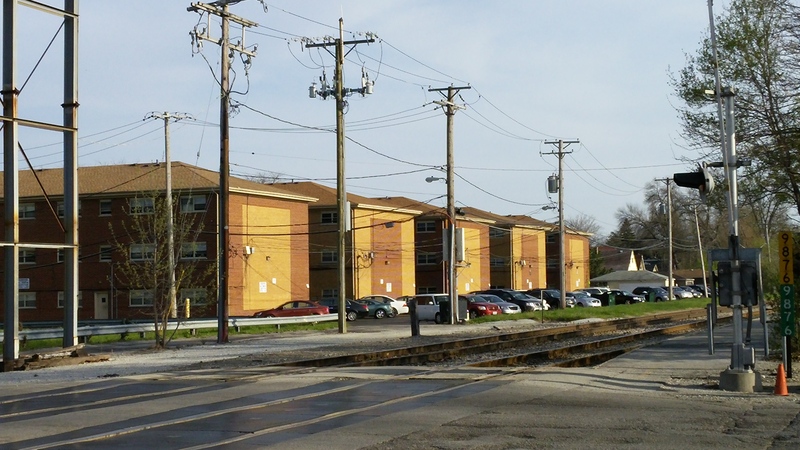 But the development near the Metra station carries another type of value: Social. With a concentrated mix of uses, people who live here can choose to live in an apartment or house while commuting downtown via the Metra and around the neighborhood on bus, bike or foot. Ideally, this would be a place where daily needs are conveniently accessible on foot. 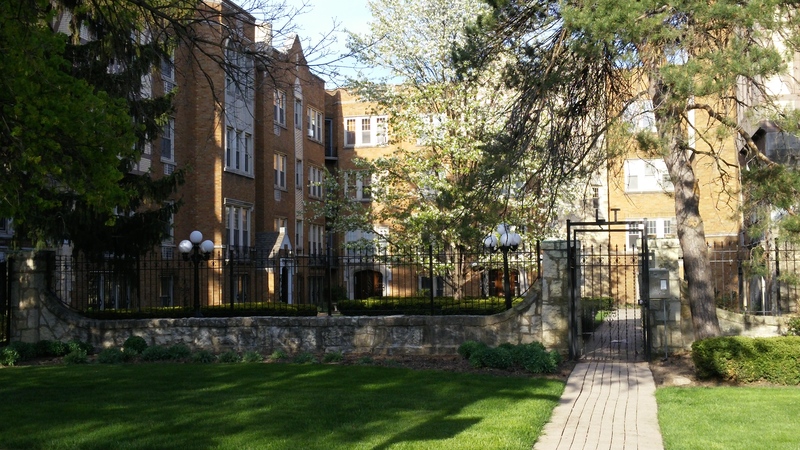 Possibly the most gorgeous courtyard apartment building in the greater-Beverly area sits within walking distance of the 111th Street Metra station. Of course, we’ve undermined this area’s strengths in the name of serving automobiles. Other than the parks, the dominant features of this district might be parking lots, from a park-and-ride adjacent to the Metra station to parking for the nearby police station to parking for nearby strip malls to parking for apartments. Other apartment buildings, while great options for living near public transportation, don’t frame the public realm quite as well as the one in the previous photo. As I’ve written before, a concentration of off-street surface lots weakens the walkability and convenience of the neighborhood. Soon enough, we’ve spread our resources thin, encouraging people to drive and cause congestion on our streets just to accomplish day-to-day tasks or go to a restaurant. So although we have components of a mixed-use, transit-oriented neighborhood in the heart of Morgan Park, we don’t truly have a place that functions like one. Moving forward, we need to seek to correct this. 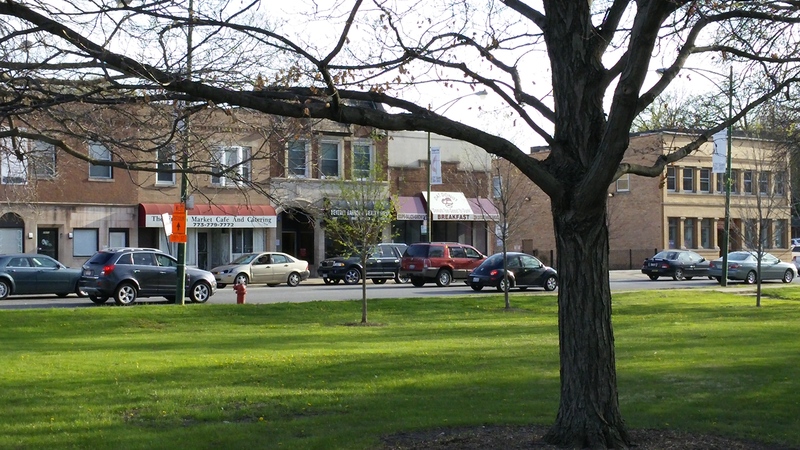 First of all, the entire area around Bohn Park should be designated as a “pedestrian street,” a city classification that discourages features that erode the public realm, from curb cuts (driveways) to parking lots that abut the sidewalk and encourages storefronts, windows and other building features that add life to the street. This is the same classification that was assigned to 103rd Street. On my bike ride, the difference in the energy levels of 103rd and 111th couldn’t have been starker. 103rd Street was bustling with pedestrians and people sipping drinks on the Starbucks patio, while 111th was virtually deserted. The pedestrians I did see in the vicinity of 111th walked with more of a purpose, which was often to cross a street that presented a hostile environment to walkers. Establishing “pedestrian streets” around Bohn Park would put the emphasis on the glorious public park and encourage the type of development that will complement the environment. Second, 111th Street and Monterey Avenue should be candidates for “road diets” — reducing the number of travel lanes to one in each direction to ease the “drag race” effect that occurs when drivers try to out maneuver each other at high speeds, adding on-street parking on the Bohn Park side to act as a buffer for pedestrians, and allowing bicyclists to move through the area safely. Given the proximity of so destination buildings, from Morgan Park High School to the U.S. Post Office to the Walker Public Library, traffic should move slowly yet efficiently, and alternative modes of transportation should be encouraged. Extending bike lanes to the area from east Morgan Park (and maybe lobbying for Divvy stations to be placed at strategic locations) could help re-establish connections between the east and west sides of the neighborhood, bringing activity together in a central location. Third, local officials and planners should work with Metra to transform the park-and-ride lot into a property that enhances the public realm. Parking at the center can remain, but storefronts that open to the sidewalk should be built around the perimeter. Residences could be added atop these, either immediately or eventually, establishing a built-in customer base for Metra. This measure also would help extend commercial space to Homewood Avenue, which has been disconnected from the rest of the district due to the prevalence of parking lots. Park-and-rides aren’t always the answer. In the 47th Ward, surface parking lots near the Ravenswood Metra station are being redeveloped and a new pedestrian-oriented shopping district is emerging in a longtime warehouse/light industrial area. Image from Google Streetview. Click to explore the area. While officials work with Metra, they also should work with the owners of properties to the west of Bohn Park that have their own off-street parking lots facing the sidewalk to redevelop in a more pedestrian-oriented fashion. Currently, these buildings house a convenience store, a laundromat and a dental center, all operations that a functional neighborhood should have conveniently located. We don’t want to lose the businesses — we just want the buildings oriented to the street in a different way. These measures would put the focus back on the strengths of the district: A highly-connected street network, a mix of uses and housing types, the Metra station and the village green we have in Bohn Park. But there is one final thing we should keep in mind: Any future large-scale development that is proposed — a la Marshfield Plaza — should be approached from the perspective of building a traditional neighborhood like we have in the area around 111th Street, with a mix of housing, shopping and office space. Rosemary Beach, Florida: A fully-functioning community built from scratch by adhering to the principles of traditional neighborhood design. A couple large shopping centers could easily take up the same footprint at this community. Image from Google Streetview. Click to explore. It’s a pattern that is infinitely more valuable from a financial perspective and social perspective. We learn this from observing our existing neighborhoods, ones like the area around the 111th Street Metra Station. Even though they have been modified over the years to accommodate as many cars as possible — to the point where they have lost much of their attractiveness to pedestrians — the bones of solid neighborhood planning are still there.